WE ARE not truly expecting Novell to issue a response to the racketeering news about Melco [1, 2, 3] because Novell too is part of the same type of racket. To make matters worse, Novell uses this racket to market its distribution of GNU/Linux at the expense of competitors while Novell also decreases its contributions to Linux. But look! 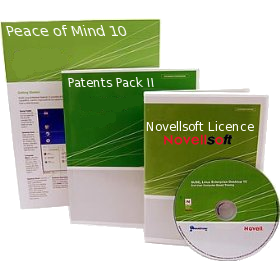 Novell acquired some more software patents last week. Just what Linux needs: software patents. Intentional-stance characterization of a general content stream or repository, patent No. 7,562,011, invented by Stephen R. Carter of Spanish Fork, and Delos C. Jensen of Orem, assigned to Novell Inc. of Provo. Methods, systems, and data structures for electronic addressing, patent No. 7,558,826, invented by A. Kent Sievers of Orem, and David R. Hansen of Highland, assigned to Novell Inc. of Provo. User MoreInterop (the Microsoft/Novell Web site) promotes Microsoft and Novell’s software patent coupons in a bunch of new videos that it has just uploaded to YouTube. That’s Microsoft and Novell fighting against GNU/Linux for which Microsoft cannot be paid owing to racketeering (notably Red Hat). The videos make it clear that it is just about the “customers” (if Novell is to be believed at all) but nobody else, including the volunteering producers of Novell’s products. Novell is exploiting and betraying the very same people that built SUSE. They are are not just Novell/S.u.S.E. employees, who were part of a collective effort that ought to be respected. In other news, the following press release has just been published and it shows how Xandros too is helping Microsoft, its software patents partner. It’s part of a trend. BridgeWays, a division of Xandros, today released a series of management packs that enable system administrators to manage business critical applications on Windows, Linux, and Unix from a single console. The new management packs help extend Microsoft System Center Operations Manager 2007 R2 to additional business applications on Windows and to the 85% of enterprise data centers with cross-platform environments. How can Xandros and Novell (and by inference Microsoft) be stopped? Well, the SFLC has just published the following post which reminds developers why they should choose the GPLv3. What we see in this agreement between the Melco Group and Microsoft is another little above-water piece of the same patent aggression iceberg that Microsoft has placed in our community’s way. They continue to shake down companies that distribute GNU/Linux systems for patent royalties. As I’ve written about before, it’s difficult to judge if these are GPLv2-compliant, but they are almost certainly not GPLv3-compliant. If there were ever a moment for the community to scramble to GPLv3, this would be it, if for no other reason to defend ourselves against the looming aggression. These are a companies that for moral reasons I will never do business with. Had an interesting conversation in church today. I told one of the guys who thinks he’s a geek, that anyone who uses Microsoft, Xandros, Novell, etc. is committing a sin, and why. I’m going to introduce him to Comes to prove my assertion. For those who know me, yes, my switch from Windows to Linux was ultimately made for religious reasons. I have the Comes documents here, followed that trial, the EU hearings, and the US Anti-Trust case. In my opinion, buying or using Microsoft products is a sin, just like assaulting your neighbour is a sin. I’m going to write up and post on the subject this week, with biblical references.